GriefPrevention Flags is a plugin to allow admins to set flags for GriefPrevention claims. Either a single claim, or a global flag for all claims. It's similar to WorldGuard, but it's more performant, easier to use, and includes many more useful flags than WorldGuard does. It also doesn't require WorldEdit to run (unlike WorldGuard). Admins can also empower players to self-serve by giving them access to specific flags, which they can then only use on land claims they own. If you are using 1.12.2 or below and experience issues please revert back to the Legacy version --> and report issues on the GitHub issue tracker. description: Sets a flag on a GriefPrevention land claim. description: Un-sets (removes) a flag on a GriefPrevention land claim. description: Sets a flag on all GriefPrevention land claims. description: Un-sets (removes) a default flag from all GriefPrevention land claims. description: Lists all the flags currently set on a GriefPrevention land claim. description: Sets a flag on an entire world. description: Un-sets (removes) a world-level flag. description: Sets a flag everywhere. description: Un-sets (removes) a server-level flag. 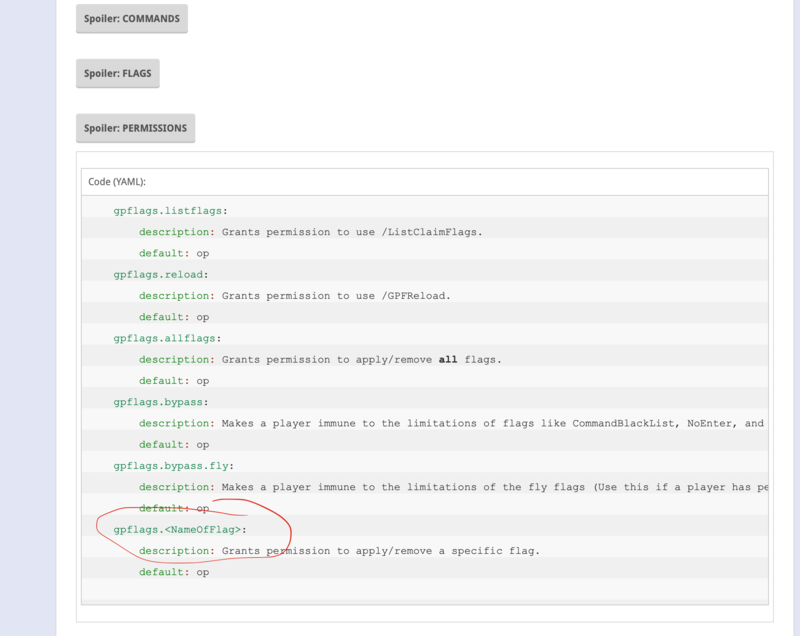 description: Reloads GriefPrevention Flags configuration settings from its config file. description: Grants all administrative functionality. description: Grants permission to use /SetClaimFlag. description: Grants permission to use /UnSetClaimFlag. description: Grants permission to use /SetWorldFlag. description: Grants permission to use /UnSetWorldFlag. description: Grants permission to use /SetServerFlag. description: Grants permission to use /UnSetServerFlag. description: Grants permission to use /SetDefaultClaimFlag and /UnSetDefaultClaimFlag. description: Grants permission to use /ListClaimFlags. description: Grants permission to use /GPFReload. description: Grants permission to apply/remove all flags. description: Makes a player immune to the limitations of flags like CommandBlackList, NoEnter, and NoFlight. description: Grants permission to apply/remove a specific flag. All of the messages in the messages.yml can be edited to be custom for your server. If you would like we now have a FRENCH MESSAGES version now thanks to @arboriginal .... just download this one, unzip it and replace your current messages.yml found in GriefPreventionFlags folder. Please do not use the reviews for a support system. If you need help I have listed ways to get support below. If you have an issue, please report it on the GITHUB page. ricardo12 and pinkpig like this. Excellent Plugin! The dev is very kind and helpful and this plugin is very well made! a good plugin with the flags. Thanks for the five stars. If you would like a feature added please use the GitHub issue tracker to suggest a feature and include details. Reviews are not the place for suggestions. very great plugin with great developer support. Also you really don't need anything else this plugin pretty much cover everything. Thank you for the review. I do my best to give the best support. Sometimes Its not always that great ;) but I do try! Im glad to hear you are enjoying it! Love this plugin, so easy to use. Lot nicer than world guard to set flags. It has allowed me to create areas for special events and even lets me create new ranks with permissions to the flags. A new 5 stars review because ShaneBee is a very nice and smart guy, he provides quick support in the Discussion thread and is very reactive to his users remarks. Thanks again, your plugin go on to work like a charm! Thanks for sharing this. It works well and don't see bugs. Hey thanks for letting me know. I will have to do some further testing. As far as I know the 1.13 version SHOULDNT be able to run on 1.12.2 due to the API method in the plugin.yml, but I will have to take a look and see what I can figure out! EDIT: After reading md_5's notes again regarding backwards compatibility... there are chances it MAY work properly, but because there are some materials that are not backwards compatible, there is always a small chance there will be things that dont work. So I do recommend using the appropriate version for your server, to make sure you dont run into any of these errors! What I've been looking for since forever!!! Thank you so much for this, you are actually a life savior. The plugin works perfectly fine and it's recommended. Thanks. I myself didnt build this plugin, so I cant take credit for it. Just got the source from GitHub and compiled it for people to use. :) Thank you for your kind words! Could you submit this to the group of people who are going to be maintaining old/inactive plugins? They might actually provide support for this as they are taking a bunch of abandoned plugins, and updating them to work on current servers. (They are not adding features, they are just making them work, is all.) Thanks in advance! You can talk to zThana about this, as she is part of this group. Hey I could probably do that.... how do I get in touch with said group? I have actually almost finished updating it for 1.13. It currently runs perfectly fine, I'm going to post another update here shortly! You deserve a medal, perfect for survival servers like mine. I know you just took it from GitHub and put it here, but for those of us who could not figure out the github version this is a blessing! Thank you for your kind words. It was quite the struggle compiling it from GitHub... but thats only because I had no clue what i was doing... but after some good time with google, i finally figured it out. I just wanted to be able to share it with the people who want/need it! Lightweight HungerGames plugin that supports Multiple Arenas, Kits, & Teams.